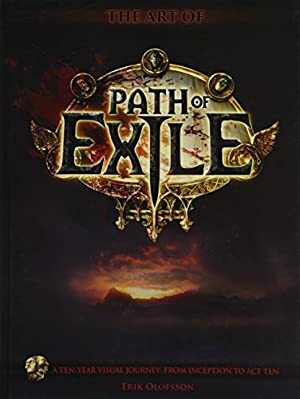 Oni Goroshi is a Path of Exile AARPG item. It is a potent one that can be obtained at level 1… but at a price. This brief guide about farming it doesn’t offer revolutionary advice. But it has what you need. The main advice being – buy it from another player. The grind isn’t worth it. But if you can’t/won’t for whatever reason, here’s the farming process. It drops in the opening zone for new characters, the Strand. This zone becomes closed once you enter the town. So you *never* enter the town until you have the sword. You exit to character selection so you’ll respawn in the Strand. Once an instance of this zone has been opened, it stays on the server from 1:30mn to 2mn (both are rough values). As opposed to the 8 to 15 minutes for a normal zone. So once you exit to character selection, the character who just did the Strand must wait up to 2mn before doing it again. There are reports of getting the sword at level 6. But it is better established that it drops at level 7. Getting to level 7 by grinding this zone will take hours. The mobs are still level 1 and their experience value goes down as you outlevel them. Once the character is 7 (or maybe 6), Hillock — the zombie boss at the end — might drop the sword. It will likely require HUNDREDS of Hillock kills. This sword was created by a player, who paid for this. So there’s a man who has money, and wants you to run a soul-abradingly meaningless grind to get a nice thing because he can. I think this is a good metaphor of most people’s life, and thus has genuine artistic value. Once again – buy it instead. If you don’t, do review that the build you intend to use it with suits your tastes, and that you can run it. It’s going to be a mind-deadening grind. 15, 18 hours of grind are entirely possible. Always running down the same beach where nothing happens. So unless you *like* repetition, you’ll probably need special circumstances. Perhaps there are chores that are compatible with running this grind. Perhaps there is this show you sort of like but not really, but want to vaguely watch to see how it ends. Something like that. Personally I did over two consecutive nights of bad, pain-induced insomnia. I was completely hammered anyway and it was a better use of my time than pointlessly lying in bed. Pathos of Exile, heh ? Make sure that PoE is on your fastest drive (SSD or NVMe) if you have one, so loading the zone is nearly instant. Start by creating two Scions. The Scion is the best choice for this since she has passive skill nodes that increase running speed, and is given an Onslaught gem (which allows for +20% movement). Since the point is to jog down the same beach hundreds of time, running speed is important. Also, it’s psychologically better not to crawl as you grind. You’re going to alternate between Scion #1 (“One”) and Scion #2 (“Two”) at first. This is so the Strand instance One exited gets deleted by the time you’ve done a Strand run on Two. So when you log in on One, you’re in a fresh instance. At first the runs are longer than the instance reset time, so you can just keep playing and swapping. 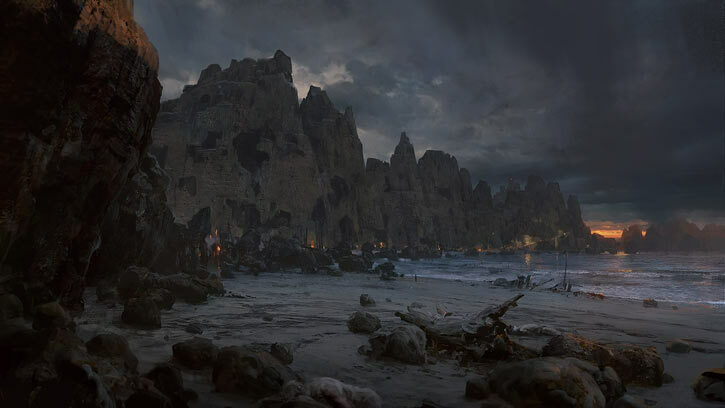 You can immediately see whether the instance hasn’t reset — the mini-map is clear beyond the first “room” with the Dying Exile. As long as you’re not level 6, each Strand run means clearing everything. Kill all zombies and spitters, and open the containers as convenient. We’re trying to level up to 6, so we need xp. Of course, the more you level, the less xp each mob brings. At level 6… well, same thing. But since it is APPARENTLY possible to get Hillock to drop the sword, be less thorough. Don’t backtrack, double-check that you’ve killed everything, etc.. But the runs must still be 90-seconds-ish. Rush to the end of the beach and kill Hillock. This’ll take about 30 seconds, assuming +10% run speed boots and the right passives and getting Onslaught twice. At this point you start levelling a third Scion (“Three”). As Three will be level 1 and do longer Strand runs, playing her means that the Strand instances for One and Two have time to reset. We only create Three now because hey, maybe you’ll get lucky and find the sword before Three reaches level 7. Thus saving hours. Identify as many boots as you can. We want to find boots with +10% movement speed ASAP. You can even use transmutations on white boots to speed that up. Avoid equipment with too much of a hidden “lowered movement speed” implicit. Equipment that speed clearing is important, even if it’s white. I’m mostly thinking about rustic sashes and iron rings. We want to kill stuff fast, like a great biotic wind. Slowly upgrade your equipment and flasks to the killingest stuff you can. Beyond movement speed and DPS, get some life regen, and (it’s important) *mana sustain*. Say, three medium mana flasks plus sources of mana regen on kill. Don’t forget that you need two linked green sockets somewhere ! If you need more scrolls of wisdom, the corpse “containers” aren’t a bad source. Since you’re going to kill Hillock so many times, you’ll likely get some uniques (and thus the Beginner’s Luck achievement) in the process. IIRC I’ve gotten Redbeak, an Ezomyte Peak, a Tabula Rasa (yay ! ), and a Thousand Ribbons robe. Some of these items have a Fated version (via the Prophecies). Objects that sell for a chroma. And fill the remaining inventory space with small rares (three slots of less). Everything else stays on this stupid beach. Even if you’re an utter pack rat, ignore it. As a boss, Hillock is the only source of level 2 and 3 equipment in the zone. Such as iron rings and medium flasks. If you haven’t sensibly given up, you’ll eventually have a beach run where Hillock doesn’t look like his usual self. It’s time for the final fight. If you’re still level 7, well you’re quite lucky. Well into level 8 is more likely. Nevertheless, “Über-Hillock” is tough. He has incomparably more HPs, he summons fast and aggressive zombies, and he has a leap slam attack. I think that the latter two appear at certain health thresholds. Keep running to stay out of melee, except for brief engagements if you have enough life regen. Chain well-angled spectral throws to kill the zombies before they build up too much – while still damaging Hillock. The many spectral impacts will keep Onslaught up so you run and throw faster. This is why mana sustain is important, so you can keep a lot of spectral steel in the air. Keep flying, o many laser buzzsaws of justice. And take heart in knowing that Über-Hillock always drop the sword. 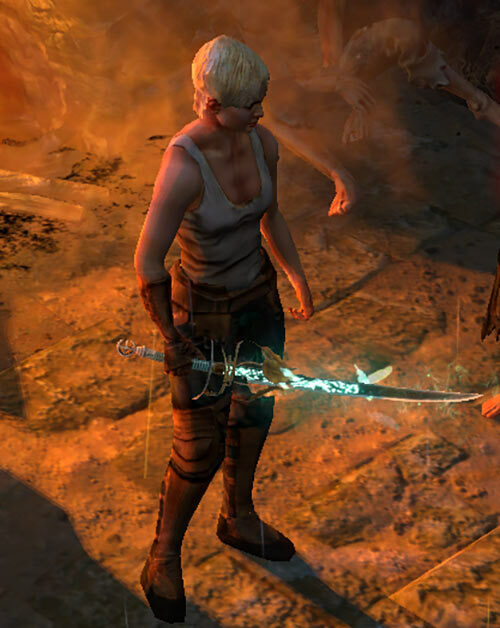 And now that you have your sword, you can… well, quite possibly go play Diablo 3 or Grim Dawn because the experience has soured you on Path of Exile. Ooops. Or you could go actually jog on an actual beach, circumstances permitting. Writeup completed on the 24th of September, 2018.